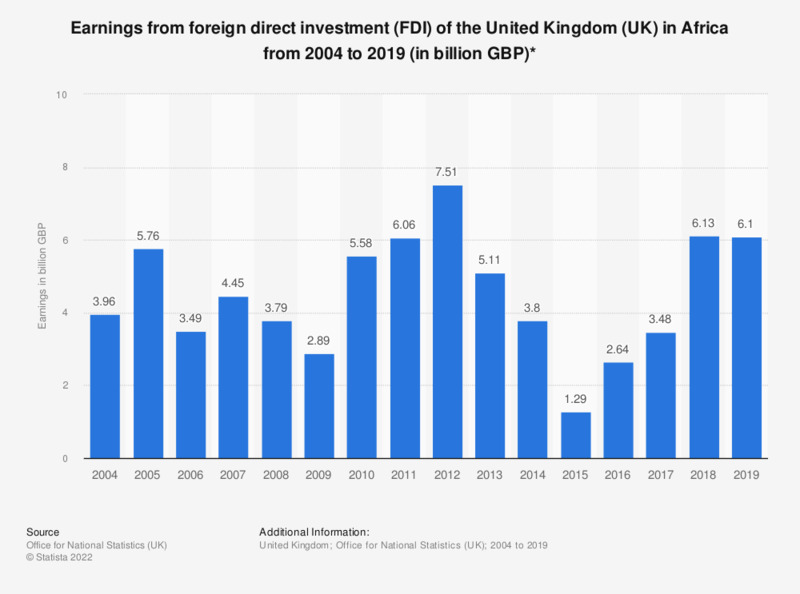 This statistic shows the earnings of United Kingdom (UK) companies from foreign direct investment (FDI) in Africa from 2004 to 2017. Earnings peaked in 2012 at 7.5 billion British pounds (GBP). There were a number of fluctuations during this 14 year period, the largest of which was between 2009 and 2010. * Net earnings equal profits of foreign branches plus United Kingdom companies' receipts of interest and their share of profits of foreign subsidiaries and associates. Earnings are after deduction of provisions for depreciation and foreign taxes on profits, dividends and interest.